DICKINSON CENTER — He is young, only 2 years old, is undernourished and is far from his Arctic home, in search of food. But, as his saucer-shaped gold and black eyes peer out from the kennel from which he was about to be freed, this snowy owl could have been in a worse situation. This is the fourth snowy owl Mark A. Manske has caught at the Ogdensburg International Airport since Jan. 15 as part of Project SNOWstorm. In late December he caught a snowy owl in Malone that he said was hanging around the airport there. Project SNOWstorm takes advantage of snowy owl irruptions, when the birds come flooding down from the northern Arctic tundra, by catching and studying them before they are released back into the wild. On this particular Saturday, in his kitchen, Mr. Manske squatted before the kennel carrier in which his recent catch was housed and peered back into the bird’s Muppet-like face. Mr. Manske, the founder and owner of Adirondack Raptors Inc., said these birds have dwindled in numbers, from a recorded 30,000 breeding pairs to about 7,000 breeding pairs. As part of Project SNOWstorm, Mr. Manske covers an area that extends from Ogdensburg to Lake Champlain. He quickly darted his large, gloved hands into the carrier and grabbed the bird before it was able to sink its talons into his arm. Slowly the black-speckled, white bird emerged from the crate, wings extended, slightly flapping. Mr. Manske cradled it and felt its chest for muscle mass. This particular bird was underdeveloped, with his keel, the extension of the sternum, protruding, a sign that it hasn’t been eating, Mr. Manske said. When he has the birds, he feeds them mice, though they don’t always accept the offering, he said. The semi-retired, 27-year high school teacher has been an adjunct professor at Paul Smith’s College, working from 2007 to 2012 and from 2015 to the present. According to his website, Mr. Manske trained under renowned biologists Frederick and Frances Hamerstrom in the early 1980s at the University of Wisconsin at Stevens Point and has been a wildlife rehabilitator from 1994 through 2002, a master falconer since 2003, a master raptor bander since 1988, and a licensed nuisance-wildlife control agent from 2008 through 2012. His experience is clearly coupled with his compassion for the birds. His participation in Project SNOWstorm is more than just a study. It is also saving the lives of these snowy owls. The snowy owl gravitates toward open areas, he said, which is why he has been getting calls to airfields, such as Ogdensburg’s. Airports are mandated by the FAA to harass the birds and chase them off, or catch them and remove them, or shoot them and kill them to get them out. 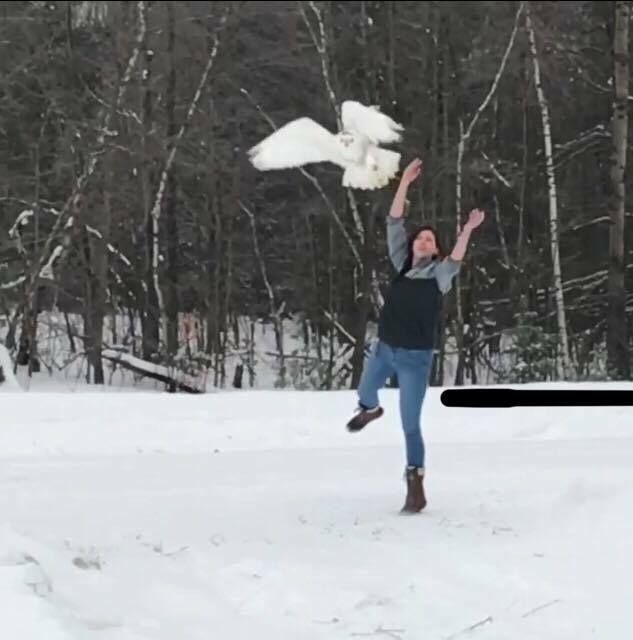 But to the credit of the Ogdensburg International Airport, its staff didn’t want to kill the snowy owls and opted to contact the state Department of Environmental Conservation, which reached out to Mr. Manske, he said. Moreover, Mr. Manske said he has caught flack from bird enthusiasts when they got wind of his work at the airport; he didn’t feel they fully understood the project and its mission. He added that although Project SNOWstorm has existed for years now, and the birds have been seen at the Ogdensburg Airport in the past, this is the first year he has been called there — a fact he attributes to the airport’s recent expansion, which he believes could have changed regulations there. As he explained the project, Mr. Manske was assisted by 20-year-old Jordyn S. Skaza, one of Mr. Manske’s students at Paul Smith’s College, who helped him weigh the bird, measuring its wings and tail and determining whether it is a male or a female. Ms. Skaza held the owl by its legs in her towel-covered lap as Mr. Manske placed a U.S. Fish & Wildlife tag around its leg. He also collected a feather for DNA testing. All that information goes to Thomas McDonald, in Buffalo. Mr. McDonald is the go-to person in New York State for Project SNOWstorm, Mr. Manske said. Once the bird was measured and tagged, Mr. Manske took a black marker and placed a silver-dollar-sized dot on the bird’s forehead as an identifier, to avoid harassing it in the future. Finally, Ms. Skaza and 21-year-old Bryan Calderaro, another of Mr. Manske’s students, walked the bird up the snow-covered road from his home to an open field. Mr. Calderaro took photos or the bird’s wing span and then, as everyone gave her a wide berth, Ms. Skaza lofted the bird up into the white sky. With wings in full extension, talons outstretched and beak wide open, the newly studied and tagged snowy owl headed out beyond the treeline in search of its next meal and, hopefully, an extended lease on life.